How To Get More Pinterest Followers How to get more Pinterest followers? One way is to make your Pinterest boards a valuable resource. There are so many accounts to follow on Pinterest. Why should pinners follow yours? The answer is because you provide them with valuable information. If your Pinterest boards are carefully curated, you will have boards that are valuable sources of information, a go-to reference source for a particular topic. 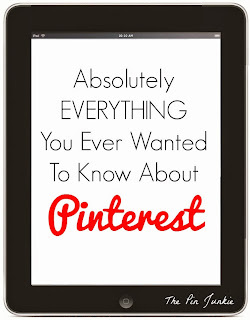 It's important to remember that Pinterest is different from other social media sites. People visit Facebook and Twitter for news, popular or trending stories, and updates on friends and current events. But people go to Pinterest to find new ideas and to be inspired. Pinterest is different, so it makes sense to approach it differently. If you’re using Pinterest with a business account, most likely your goal is to get exposure for your product and/or to bring traffic back to your site. And while you’re maintaining a presence on Pinterest, it certainly doesn't hurt to encourage pinners to follow your Pinterest account as well! To do that, you’ll want to give people a good reason to follow you. 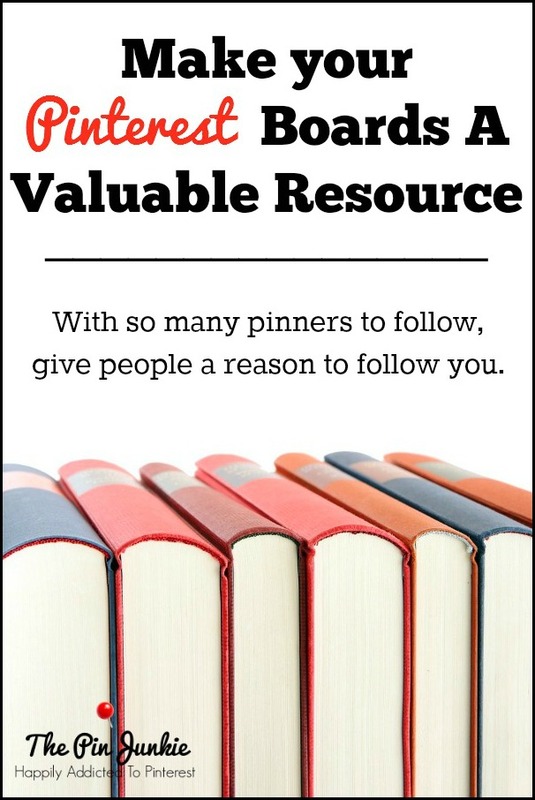 There are so many accounts to follow on Pinterest, so you want to give potential follows a compelling reason to follow yours. Make the choice for someone to follow you an easy one by creating Pinterest boards that are an excellent resource on a particular topic. Just as you would provide valuable, high quality content on your blog or website, you also want to curate excellent content on your Pinterest boards. Curate excellent content. Attractive images are important on Pinterest, but those images should link back to high quality content. Links on pins should work and they should direct users to the correct web page. Information is organized and easy to find. Board titles and descriptions should state clearly what each board is about. Boards should be organized in a logical way to make information easy to find. Place boards. If you have a local business, place boards can provide valuable information about your location. Provide tips and how-to boards. Provide your followers with information on how to do something. Make your Pinterest page a valuable resource that is all about food. Create boards with topics such as one-dish meals, desserts, salads, etc. If you have a specific focus like healthy, low-calorie, gluten free foods, include those specialized topics as well. You can also create boards relating to food such as table settings, beautiful kitchens, and dining rooms. Meals are often the center of family celebration so you could also create boards for holidays foods and recipes for special occasions. The main focus of your Pinterest page would be about jewelry. Each board is a sub-category relating to jewelry such as earrings, necklaces, bracelets, beading, metalwork, and other jewelry making techniques and how-to's. Remember, don't pin just your own images. It's certainly ok to pin your images from your site, but make sure you provide your Pinterest followers with great pins, ideas, and sources from all around the web. If you provide value in the form of high quality and useful content on a particular subject, people will gladly follow you on Pinterest. Find more great Pinterest tips here!